There's a lot to like about BioShock Infinite. It's gorgeous looking, the music is spectacular, and the story is good enough that a couple days after finishing it, I'm still turning it over in my head. But the game has one glaring problem: combat just doesn't work all that well. In some games, that wouldn't be such a huge deal. Unfortunately, combat is Infinite's primary activity—if you're not walking around, gazing at vistas, listening to Elizabeth and Booker talk or scrounging for pre-recorded backstory, you're probably frantically running around shooting at dudes. The question of whether or not combat actually serves BioShock Infinite in a general sense—did this game need to be a shooter?—is a question for another day. (Short version: No, I don't really think it does, or that the game did.) For now, I wanted to talk a little bit about why the combat doesn't work very well. In other words, my issue at the moment isn't with the fact that the game has combat at all, but more with how it's implemented. I've never been a huge fan of the combat in BioShock games. 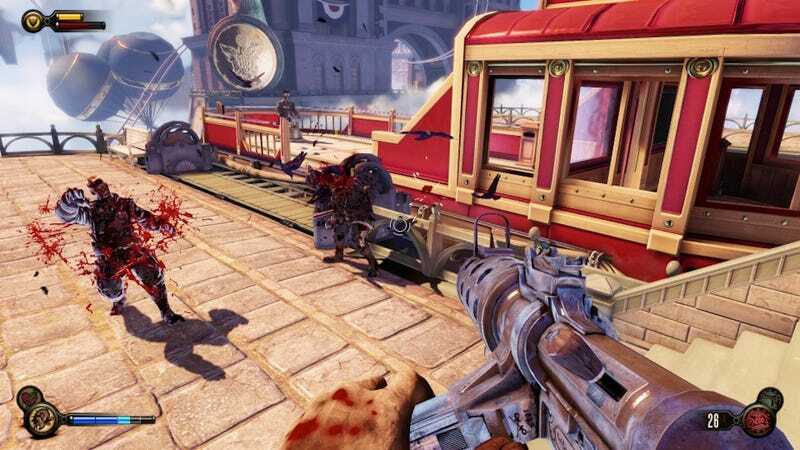 It's always felt "shouty," for lack of a better word—fighting splicers in Rapture felt more or less like getting into a screaming match with a half-dozen guests at a dinner party where there's poor acoustics and everyone's already talking above their normal speaking volume. That said, I returned to the first two games upon finishing Infinite and found that compared to the new game, the first two almost feel like tactical strategy games. Infinite on a calm day is louder than BioShock at its most hysterical. There are a lot of reasons for that, chief among them that BioShock's whole ecosystem putters along on its own in a way that Infinite's doesn't. But more crucially, almost every enemy in Infinite has a gun, whereas in BioShock, advanced weaponry was more of a rarity. In Infinite, guns can tag you from across an entire level, and enemies are very accurate. To offset this, Booker can run much faster than Jack or Delta in the first two games, and has rechargeable shields. Both of those things were likely moves aimed at mitigating the fact that every enemy is now packing heat. Late in the game, basic armored enemies take a clip and a half to take down, all while firing rockets and grenades at you from across the map. It's chaotic. • I see some guards walking up ahead. They don't see me yet. • Okay, they saw me! And now everyone is shooting at me. • I trigger "Murder of Crows" and make them stop shooting me for one second. I kill as many as I can. • Now there are more of them, so I trigger Murder of Crows again, and run forward to the left. • Somewhere a turret has seen me; I hear its signature ringtone and know I'm about to lose some health. Maybe it's a flying mosquito or maybe it's a regular turret, but now I'm getting pegged and I can't tell from where. • There are people everywhere, yelling, and I just sort of fire off Murder of Crows in a direction and shoot where I see the "vulnerable" signifier. • I can't figure out why I'm being shot, then I realize there was a dude standing behind me and shooting me while my attention was focused forward. I die, and hop back into the level from a waypoint. • I locate the turret, so I take cover and try to destroy it while getting shot by a bunch of other people. • Elizabeth tosses me some ammo/salt. • I jump onto a skyline and keep getting nailed by bullets—I have no idea where the enemies are, but I rely on the auto-aim from skylines to find someone to shoot at. • I land and use Murder of Crows to freeze/kill more guys. • There's still one guy somewhere in the level, so the combat music keeps playing… I can hear him talking but can't find him. • I do a skyline run to find the last guy, and as I'm doing so I think, "Oh wow, this is a neat level, I didn't even notice!" • I find the guy and, just as I kill him, Elizabeth offers me some more ammo. But then he's dead, so her offer is rescinded. D'oh! Playing Infinite, I realize that Halo-style recharging shields are actually a huge mistake in shooter design. But all shooters use them now. Since people are going to ask: There are two problems; one is about emotional pacing, one is about gameplay crispness and fairness. With shields, you are always doing okay in the medium and long term. They low-pass filter the emotional high of surviving a tight situation. You can have a tight situation on the order of 10 seconds, but not on the order of 5 minutes, which matters more. The crispness problem is: In order to provide difficulty, designers now have to overwhelm your shields all the time, which means designing situations that are spammy (get hit from all directions so you can't process what is going on). These are confusing and not fun. These feel messy to play but they happen all the time because they have to. Or, like Infinite does, have super attacks that take away all your shields at once *and* 1/3 of your health, which feels steeply unfair. Also, shields train the player to ignore getting hit most of the time, which becomes grating at the end when guys start hitting hard. (You trained the players for one thing but then gave them another!) I think shooters are much stronger experiences when it matters if you got hit. In shield games you get hit all the time, like flies buzzing. I like a lot of that, particularly the stuff about crispness. I'm not entirely convinced that this isn't a chicken-and-egg situation, since perhaps the new game's machine-gun injection (and removal of BioShock's triggerable health-kits) necessitated the addition of the shield, but regardless, the shields and the shoot-happy enemies form a symbiotic relationship that isn't all that fun to jump into the middle of. Blow's critique has prompted a lot of interesting back-and-forth with a number of other designers, each of whom has weighed in with his or her own thoughts on why Infinite's combat system was designed the way it was. You can follow him on Twitter to get more of that. Except for a few frustrating moments, I had a suitably okay time fighting through Infinite's many battles—that skyline really can be a rush!—but I do wish the combat had felt a bit more fluid, a bit more controlled, and a bit, well, smarter. That's doubly true, considering how smart the game is in other ways. If I'm going to have a deep conversation about religion, politics and metaphysics, I'd prefer not to have to shout over the din.